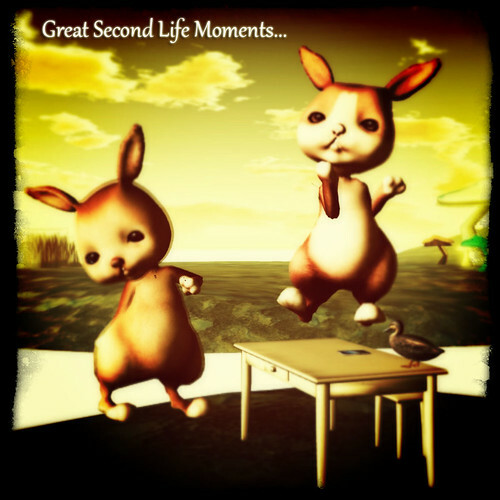 When I first heard of mesh in Second Life, I was just downright puzzled. “It moves” I was told and I thought: “So what?”. These days I am a lot more convinced about mesh but not to the fullest extent. I don’t need mesh for everything. It’s really sometimes easier to let some things be classic prims with mod rights. However – the one thing mesh is really, really great for are avatars made of that. Mesh allowed the birth of Petites! For those of you that have not seen Petites yet – they are tiny avatars… about as high as ur knee and they still move naturally and smoothly. No edges to the joints or anything and u can still run your AO wearing them. I don’t want to go into detail how it works – cause that still puzzles me a bit – but want to mention that something made of mesh is an object. That means you cannot alter a mesh avatar – tho it looks human – as you could with your normal avatar. You cant just put a tattoo layer on and off or wear any clothing you like. The mesh avatar either comes with it or does not. You are basically substituding one object part with another then. There are currently only a few creators out there that create mesh petites.